Carmakers used to assume a lot of things about older drivers, and having fun wasn’t one of them. So they designed Intracoastal dredging barges on wheels that bobbed over speed bumps like sailboats and came with trunks big enough to restock a Publix. Baby Boomers have changed all of that. Now of retirement age, Boomers want cars that take a corner. They want to throw mountain bikes in the back. They want something that looks good pulling up to a valet or when splashing through mud during their latest adventure. Like the cars we feature here. We intentionally selected rides that surprise, that seem as though they should cost far more than they do and are guaranteed to provide fun when one slips behind the wheel. Look back at family photos from a generation ago and you’ll notice something about the older generation. They looked old. Not so nowadays. Grandmas do yoga and Grandpas ride race bikes. For this generation, there’s the Volvo S60 T6. The real style is inside this sports sedan, where you’ll find leather seats as comfortable as a favorite old jacket, a swooping piece of decorative metal on the door and a clever floating center console with enough space behind it to hide a small purse. The console holds actual buttons that control the radio and air conditioning. This is well-designed Swedish furniture. This is a northern European eye for art. There’s some pretty impressive technology in a sedan that starts at just $37,000. Most notable is a system that, if you start to drift, nudges you back into your lane. It’s unnerving at first, but it guided us in our lane down miles of Broward Boulevard with our hands – unbelievably – off the wheel. The steering of the S60 tightens up at lower speeds to hug turns. The supercharged engine somehow yanks 300 horsepower out of just four cylinders while also getting 30 mpg on the highway. Good looks and always up for fun? Sounds a bit like the older crowd these days. When the kids leave home, there are a whole lot of upsides. Like that extra spare bedroom, vacations that don’t involve mouse costumes and the freedom to ditch that giant shipping container on wheels. If you’ve gotten used to that up-high seating position, you’ll need a transition car, as in a small SUV. As in the Lincoln MKC. This is an American car that hasn’t just caught up with the imports but has passed everything in its class. First, there’s its beautiful shape. It slopes gently like a sports car, from the angel-wing Lincoln grille all the way to the spoiler adorning the back window. A couple of creases run the length of the sides and make it appear always in motion. Inside, it’s even more stunning, with our tester adorned in wood accents streaked in blond and brown. Soft leather is stitched into everything else. The dash features handy knobs and buttons missing in a lot of touch-screen-heavy cars. The panoramic sunroof makes this one of the sunniest SUVs. There’s a whole lot more to gush about, including a peppy engine, an excellent sound system and a price tag (our tester came in at $48,500) a few grand below comparable Audis and BMWs. Approach the car at night and the Lincoln symbol illuminates the ground in front of the driver’s door. Maybe the reason is that it helps you see. Or maybe it’s just that Lincoln wants to boast about the MKC. In North Carolina there’s a thing called a halfback, and it has nothing to do with football. It’s someone who came to Florida from someplace cold up north. Then, when the summers became too hot, he discovered the cool mountains of North Carolina. So he went half back. As a halfback, spending your summers in someplace more temperate likely means driving there, and that requires finding a car that you’ll be glad to occupy for the equivalent of a workday. 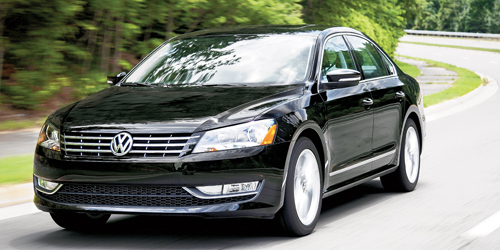 The Passat TDI makes its case with this simple fact: With a full tank of diesel, the dash displays a range of 700 miles. A long drive means the necessity of a comfortable car. The Tennessee-built Passat is that, although it’s also spare, with few extra lines more than what’s necessary to fold sheet metal around the frame. The inside is a minimalist’s paradise, with no more knobs and buttons than necessary. That makes things simple for those who don’t want their car over-complicated. Even the touch screen is controlled by icons as large as the buttons on a sport coat. Volkswagen bills itself as the sporty car company, but the Passat is more like a cushy cruiser, with light-as-air steering and a high-ride suspension more akin to Dad’s old Buick. Spring for the premium trim – adding things like leather, two power seats, remote start and dual-climate controls – to make things truly cushy. That raises the base $27,000 price to a reasonable $34,000. That sticker buys you a comfortable car that does something worth bragging about to all the other halfbacks: It gets you to the North Carolina border on one tank of gas. We all like to think that we’re the good driver, that everyone else is the road nutcase. So for the first few days in Cadillac’s flagship sedan we complained about the alarms and warnings that would go off anytime we got too close to hedgerows or another car or a wayward jogger. Then there was the morning with the near-collision. There was a driveway, a backup procedure and a poorly placed trash can. Just before the rear of the Caddy came crashing into it, the brakes were mysteriously applied, a warning whistle sounded and the XTS came to a stop, just inches from impact. The Cadillac helps fix the potentially bad driver in all of us. In fact, the Cadillac does many things well, from styling to a Ritzlike interior to a fun-to-drive quotient that is surely going to surprise you in a car this big. The only disappointment is the touch screen, which controls pretty much everything. It makes something like changing the radio channel difficult when driving, and even more so if you want to switch from navigation to climate control. Otherwise, what a car. It has the styling of a coupe with an angle to the front and back windows that makes the car look like it’s always gliding. There’s a big amount of bling too, from the 20-inch rims to the silver grille that catches the sunlight. Inside, the Cadillac looks as well done as cars twice its price – just try to find a surface that doesn’t feature wood or stitched leather. Spring for the Platinum edition and the car gets packed with things like a heated steering wheel, adaptive cruise control, panoramic sunroof and automated parallel parking. All of this and a sticker price around $53,000. Maybe the Cadillac’s luxury won’t surprise you, but its fun factor might: a 300-plus horsepower engine that you probably will never get to floor and an adaptive suspension that handles a speed bump perhaps more deftly than any luxury car out there. They say the average age of a marathon runner is just shy of 40, and if you’ve ever run one, you know there are plenty of people far more seasoned who cross the finish line. You’re likely to see the same kind of people renting paddleboards, tugging on kite boards or generally just refusing to get older. For those folks there’s the Mercedes GLA 45 AMG, a car that could race a Porsche and also hold a kayak on the roof. This little hatchback is a rocket ship. The size of a GTI, it has an insane six-cylinder with 355 horsepower and an exhaust tuned to disturb-the-neighbor settings. It’s always growling, even when slow. Step on it and the back end will gurgle and bark like an angry bulldog. The interior offers the kind of simplicity so many cars ought to copy, with just a few dials and a touch pad to control everything. Skip the AMG sport seats, though, because unless you’re planning on spending your days driving on racetracks, those things are as hard as a surfboard. Now, granted, you might be just as happy driving the lower-end GLA 250, which has a more reasonable engine and a higher and far more comfy ride. It also has a far more reasonable starting price in the low $30,000s, meaning you could buy two of them instead of the GLA 45 AMG. But if you want to get to the boat launch in a car that’s never not fun, well then, just floor the GLA 45 and listen to that bassy exhaust melody. Like most of us, Rich Herter and Dennis Baney had never owned an electric-only car until they bought their Tesla Model S. And now? They wish every car was as fun. Herter, a 65-year-old former Home Depot executive, and Baney, a 60-year-old interior designer, live in the Rio Vista neighborhood of Fort Lauderdale. How much do they love their Tesla? Enough to name it Tess. PRIME: Is it tricky to get used to the Model S? Herter: The Tesla Model S is a computer on wheels. All you do is put the key in your pocket, approach the car, and it greets you by flashing its lights and extending the recessed door handles. Sit down and put your foot on the brake and that awakens it from its sleep. The car has less than 100 moving parts, and the electric motor gives you instantaneous pickup. It is the fastest, most responsive and stable car I have ever owned. PRIME: How long did it take you to get used to plugging it in? Herter: I have an alarm on my phone that goes off every night at 9 to remind me to plug in Tess. I don’t miss the gas stations one bit. PRIME: How hard is it to learn the technology and the car’s massive touch screen? Herter: The large computer screen has menus that are simple to understand. Tesla gives you one-on-one training for about an hour before you leave with the car. That was plenty of time, and they are always available by phone for any questions. If software changes are made to the car, they are updated by a download that occurs in the middle of the night. PRIME: Anything else we should know? Herter: If you are having a problem with something, the first thing they tell you to do is reboot the car. That has always worked, just like any other computer.